Does your dog inhale his food? For Rocco, eating is like a race to the finish. He's finished eating in a matter of seconds and then looks up at me asking for more! 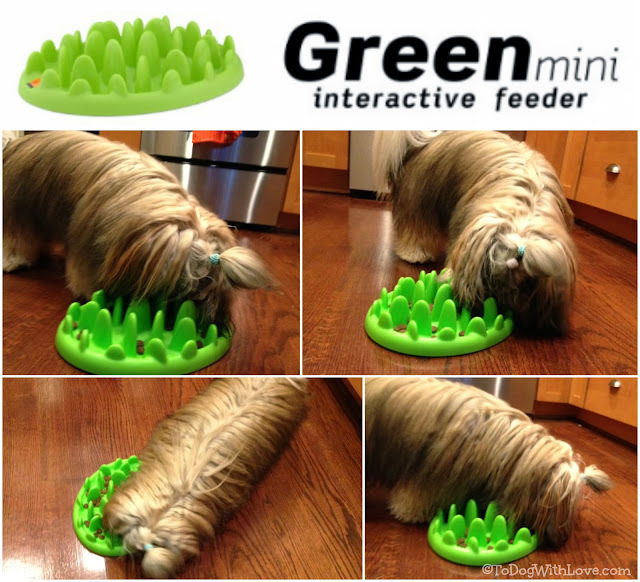 So when I saw the GREEN interactive feeder by Northmate from The Company of Animals I was intrigued. It looks a bit like tufts of grass, but it's made of hard plastic (without phthalates). It's designed to prolong eating time, which helps reduce the risk of gulping and bloat. And, because of its special design, it turns your dog's meal into a challenging game. We were sold. But the original feeder seemed a bit large for a small dog like Rocco. So when GREEN came out with a mini feeder we were super excited to try it out! The mini is about half the size of the original GREEN and the "tufts" of grass are shorter too, making it a little easier for small dogs, puppies and flat-nosed breeds to maneuver. 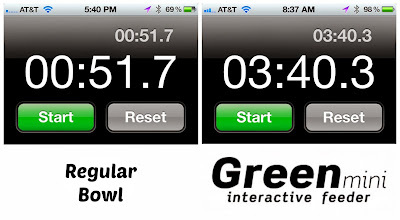 It still provides the same meal-time challenge, but the smaller size is better suited for a small dog like Rocco. So how much longer did it take Rocco to eat? The results of our time trials showed a pretty significant slowdown with the GREEN feeder. Maybe not as much time as the pup displays in the video below, but it did present a challenge for Rocco and it kept him from inhaling his food! 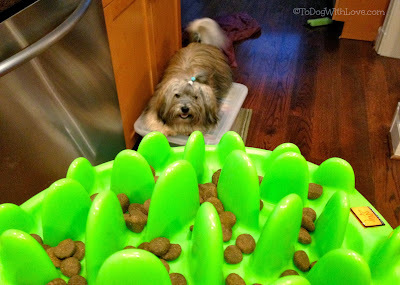 We would definitely recommend the GREEN for some challenging mealtime fun and to slow down a dog who gulps their food! Check out a few pups in action in the video below! Enter via Rafflecopter below. One winner will win a GREEN Interactive feeder in the size of their choice. U.S. winner only. Disclosure: We received a GREEN feeder by Northmate from The Company of Animals to review and one to giveaway. All opinions expressed herein are entirely our own. That is brilliant. I have been looking for something for Ancient Pip to keep her occupied and a kong is no good because of her teeth. Off to see if we can get one here. Have a wonderful Wednesday. Yes. Sissy gulps her food down. By the time I get back from the loft to feed the cat, it is gone. heehee! It really is fun Lily! Not torture at all! I think this is brilliant!! My dog has this pear shaped toy, rather big. We fill it with pieces of treats and some dry dog food before bed and he goes at it. Food fall out a small hole on one side and he has to knock the ball around until it all comes out that little hole. He loves it. He EXPECTS it every night now. He will like this, I think! Yes - one of our three does...we got a slow down bowl...but it already seems like she is defeating it....I've seen this before and would LOVEEEE to try it! I have a super-gulper. Sometimes she will start to snort and wheaze like a kibble went down the wrong pipe, then hacak it up and eat it. Ack! I have five Treeing Walker Coonhounds, and while four of them eat at a more reasonable rate, I rescued my Kyoko from a kill shelter in SC where she weighed just half of what she should have. Kyoko was in starvation mode, and while not only has she gained weight, she's become downright chubby. Kyoko was 30 pounds at the shelter (and full of buckshot). At 60 pounds she was perfect. She is now just over 70 pounds and I need to get her back down to 60 pounds. Getting her something like this would slow down her eating and would likely help me get her weight under control. Scylla gulps her foods. We thinks this feeder would be funs. We could play and eat at the same times. We saw this at the store the other day and thought it would be ideal for my little sister...the one from a litter of 14 that we are constantly trying to get to slow down when it comes to food. She is a serious gulper! My Aus. Shepered inhales his food! I would love to try one of these! I have a little guy who literally INHALES his food. We've tried everything to slow him down, but nothing really works.. and he gets the most terrible gas from eating so fast! We would LOVE to win this for him! My Australian Cattle Dog Hobie could use one of these! Shiloh gulps his food down when I feed him out of a bowl. My dog is picky when she eats. She will eat for tricks if her food is in a puzzle. Silly pooch. My little pooch doesn't, but the Lab of the house is like a Hoover. I'm pretty sure he doesn't chew. The foster pup gulps his food down like there's no tomorrow. He could definitely use one of these. I swallow it all whole...whatever is in front of me! Woof. Stella doesn't gulp all the time, but she does sometime! But i love it for the mental stimulation. We have both types 2 are gulpers and one likes to take his time. Need less to say they have to be kept seperate. Out of my four dogs, one of them is a gulper. Duke inhales his food, he eats it so fast I am amazed! We've been looking at feeders like this, so I'm happy to see your review! At first I thought it was just so funny looking, but that really is cool, and it works! Very clever. Itsy and Diamond don't chew they just swallow and eat as fast as they can! Besides being a great and helpful product I think the dogs would have fun using this (trying to find each kibble :). My one dog has Addisons disease and is on pred, so he's hungry all the time. So yes, he eats FAST. Artie gulps his food so fast, I sometimes wonder if I fed him. Luna needs one of these. It takes her 2 seconds to eat if it is in a bowl. I wish she would slow down! Vix is a very picky, very careful eater... one piece at a time with her. Her Springer brother was a "snarfer" though, and I wish I had had one of these with him. This would be for my sister's new rescue though. He just inhales... it's actually fascinating to watch. Not good for him though, so this would be great. Thanks for the giveaway. Email subscribe with loveSpringers at hotmail [dot com]. My dog doesn't gulp but he eats super fast.